January 16, 2012, Vancouver, Canada. - El Niño Ventures Inc. ("ELN" and the "Company") (TSX.V: ELN; OTCX:ELNOF Frankfurt: E7Q) is pleased to announce significant diamond drill results of the 2011 drill program on the Murray Brook massive-sulfide deposit located in the Bathurst Mining Camp in New Brunswick, Canada. Votorantim Metals Canada Inc (VM Canada) is the operator of the program. The entire 2011 program consisted of 60, vertical drill holes, totalling 10,327.5 m. Results of 18 drill holes were announced on November 24, 2011 (please see Press Release dated November 24th 2011) and the results of 15 holes are included in this announcement. Table 1 below illustrates significant drill results from the spring-summer drilling program. All drill holes included in this announcement intersected massive sulfides. The 2011 drill program was successful in defining the deposit in areas of low drill-density, confirming higher-grade intercepts in historic drilling, and delineating the margins of the massive sulfide body. Data from the 2011 drilling program has been provided to to P&E Mining Consultants Inc. (Brampton) who will complete a NI 43-101 mineral resource update within the first quarter of 2012. The 2011 drill program was designed to start on the south, near-surface, portion of the deposit where thick, massive sulfide intercepts of high-grade zinc were recorded in historic drilling. The drill program then moved to the north, to systematically test deeper portions of the massive sulfide body. Figure 2 below shows the location of the completed drill holes. 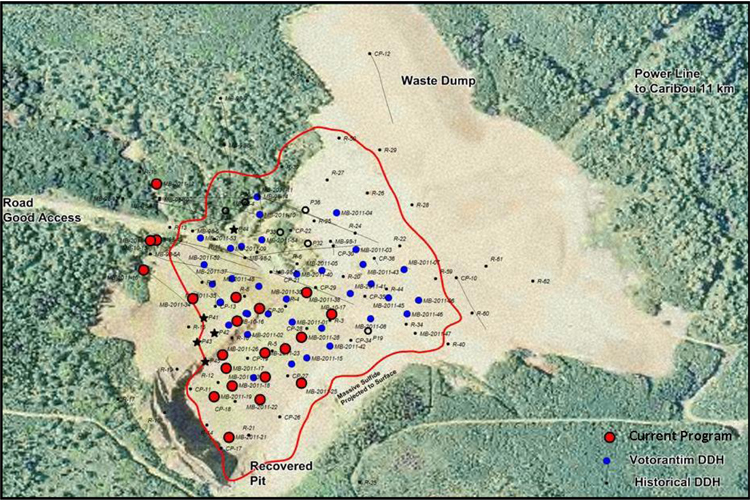 Bathurst Mining Camp Project: (TriParty Agreement) Consists of an initial 4,712 claims in the tri‐party agreement with Xstrata & VM Canada whereby VM Canada may incur exploration expenditures of $10 million over a period of 5 years to earn a 50% interest. VM Canada may further increase its interest to 70% by spending an additional $10 million over 2 years. 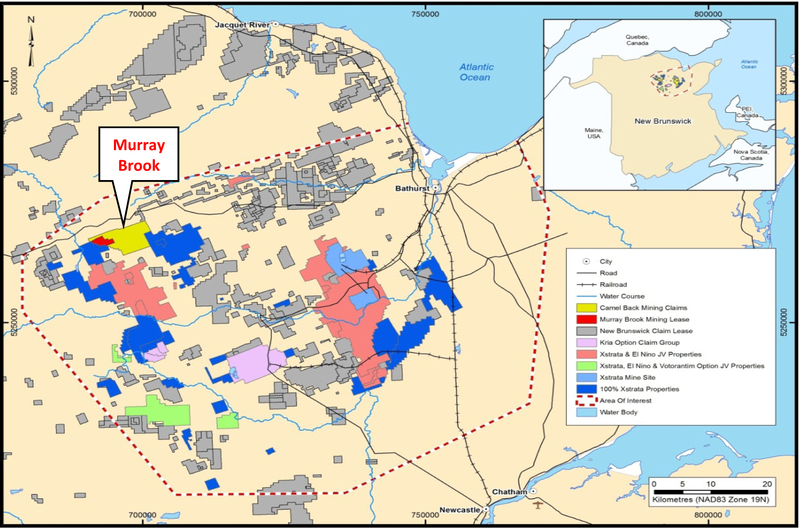 Murray Brook Project: Under Votorantimʹs Option and Joint Venture Agreement with Murray Brook Minerals and Murray Brook Resources, both privately held companies, Votorantim can earn a 50% interest in the properties by funding $2,250,000 in exploration expenditures and making payments totalling $300,000 over a three year period commencing November 1 2010. Votorantim can earn an additional 20% interest in the Properties by funding an additional $2,250,000 in exploration expenditures over an additional two year period. ELN has elected to enter into a participation agreement wherein it can earn 50% of Votorantim's interest by paying 50% of the costs incurred by Votorantim in the Option and Joint Venture Agreement. In January 2011, ELN announced that it has provided notice to Votorantim Metals Canada Inc. (Votorantim) to enter into a Participation Agreement on the Murray Brook Massive Sulfide Polymetallic deposit situated in the Bathurst Mining Camp in New Brunswick, Canada. (See press release dated January 20th, 2011). The Murray Brook 2012 Exploration program budget is currently set at $2,500,000. This program will consist of a multi phase drill program and a NI43-101 resource estimate with preliminary tonnage and grade calculations to be completed in Q1-Q2 2012. Neither the TSX Venture Exchange nor its Regulation Services Provider (as that term is defined in the policies of the TSX Venture Exchange) accepts responsibility for the adequacy or accuracy of this release. Note: this release contains forward-looking statements that involve risks and uncertainties. These statements may differ materially from actual future events or results and are based on current expectations or beliefs. For this purpose, statements of historical fact may be deemed to be forward-looking statements. In addition, forward-looking statements include statements in which the Company uses words such as "continue", "efforts", "expect", "believe", "anticipate", "confident", "intend", "strategy", "plan", "will", "estimate", "project", "goal", "target", "prospects", "optimistic" or similar expressions. These statements by their nature involve risks and uncertainties, and actual results may differ materially depending on a variety of important factors, including, among others, the Company's ability and continuation of efforts to timely and completely make available adequate current public information, additional or different regulatory and legal requirements and restrictions that may be imposed, and other factors as may be discussed in the documents filed by the Company on SEDAR (www.sedar.com), including the most recent reports that identify important risk factors that could cause actual results to differ from those contained in the forward-looking statements. The Company does not undertake any obligation to review or confirm analysts' expectations or estimates or to release publicly any revisions to any forward-looking statements to reflect events or circumstances after the date hereof or to reflect the occurrence of unanticipated events. Investors should not place undue reliance on forward-looking statements.